Minnie tells me about her trip to Topeka to visit her sister Bertha and of her disappointment upon returning to Manhattan and learning that she had missed an opportunity to accompany my mother (Hattie) and my twin brother (Willis) to visit me at Camp Funston on Sunday. She finishes her letter the following day with more news about her school and tells me that Bertha will stay in Manhattan while her husband Charlie goes apartment hunting in Washington D. C.
I don’t know what your address is but I know it isn’t Manhattan anymore but maybe you will write to me within the next month [and] then I can send this. I am so disappointed tonight that I hadn’t ought to try to write. I wanted to see you so badly and had planned on it. I paid Roy Hoffman (a school boy) fifty cents for taking me to Garrison Crossing yesterday. Then I caught the “Flyer” out from Manhattan – it was nearly an hour late. I didn’t get into Topeka till about four. Had a fine visit with the kids until I had the phone call from Mama. Then I thought of nothing but to get home. I was tickled to death. [My sister] Bertha and Mama were cut off [however] and we couldn’t get connected up again. So all I knew was that your mother called up and asked me to go up to Camp [Funston] with them. When I got in Manhattan, I expected to see your folks at the depot but didn’t, so I called out home. Folks said they were just ready to start for me and for me to stay at the depot. Papa came and took me up to Wolf’s. They said your mother had been there about fifteen minutes before so that is all we missed them. I made the folks stay there for quite awhile. I was sure your folks would be back. The folks said that no doubt they had gone on, but I wanted to go so bad I wouldn’t let myself believe that they would go off and leave me. Papa had a committee meeting at church or he would have taken me up to see you. I tried to call your mother this evening about six o’clock, just before we came up here but I guess she wasn’t home yet. I wanted to hear about you and find out your address. My, if I make my letter in proportion to my starter, I would sure write a long one. I must begin to cut the length of my letters down. I’m using too much paper and this is war times and then I get such “dinky” little cards from you. I just received your card today that you must have written Thursday. I hope it doesn’t take all your letters that long to come, but of course it laid over Sunday. I feel so good tonight. I sure wish I could be with you. I feel so smiley all the time this evening. School went fine today and I had about six lines from the dearest boy on earth. I don’t feel so bad today about not seeing you yesterday, although I always will think it was a shame. I went to bed last night and cried about an hour and this morning felt fine. When I’m cross about something, I generally have to sleep on it one night, and then things don’t look so bad. In a way, I’m a little glad you didn’t see me yesterday. I have an awful fever sore on my upper lip. It’s been there for a week. [My sister] Bertha and [her husband] Charlie said it doesn’t pay to bid soldier boys good bye, etc. I read in the paper tonight about the farewell they had for soldiers in Manhattan. Since when have you changed your name to Evan L. Griffing? I suppose your mother took you a letter from me yesterday. She will get another one today. I won’t send this till I know your address. Mama said she would let me know as soon as she could. I don’t like your ‘Bill a fare' very well. But I guess you will get fed pretty well. I certainly hope you will. What kind of a person have you for bunk mate or do you have one? When I see you, you remind me of my ride to Topeka. I have a volume to tell you about it, but lack of space won’t allow me to write it. Here I am starting my third sheet. Why this is just terrible. I won’t leave so much time to write after awhile. I have to outline a 315-page book and it is dry reading too. I haven’t started it yet. Last week I didn’t have my ink yet, and now I never have my pen and notebook paper at the same place. I was going to start tonight but my notebook paper was at school house. I think I shall write real small. Then I won’t cover so much paper saying nothing. Bertha is coming home for at least a month to stay. That will be fine for us but awful for [her husband] Charlie. I suppose your mother told you about Tina’s and Dean’s boy? I wonder what they will name it? Only four more days of school and I can go home to see you. Only three more days till the day I go home and then – I just can’t hardly wait. I’m so anxious. It’s been so long, I can’t hardly remember what you look like anymore. I will get your picture too, I’ll be glad of that; then I can’t forget. Did you have a good time (that’s a foolish question, of course you did) and who all was at your farewell party? Also, where was it? I just heard someone say that there was one. P.S. Somebody asked James Chalmers (a first grade pupil) what his teacher’s name [last name] was. He said he thought it must be Cook. They all laughed so, and he said he knew it was something they did when they cooked. His Mama had tried to make him remember my name that way. Sure glad to know you are alright and am anxious to hear from you again. Write lots of big long letters, Boy. The mail man stops at the school house if he has anything for me and one of the children run out and get it. That makes it nice. You know I always said I was so afraid that I would get the giggles in school if something funny should happen. Well today I was nearly bursting trying to straighten up and not laugh. I got the hiccups while I was pronouncing the spelling words to three classes. The poor kids wanted to laugh so bad and one boy did crack a smile and I took a hold of his shoulder and spoke to him. Then I turned around and nearly died. I wanted to laugh so and I knew I just couldn’t then. Mr. Parkerson has gone to the [State] fair [in Topeka]. Mrs. Parkerson and I are alone having lots of fun. School is just going fine. Children like their teacher. Hurrah! Goodnight. Roy A. Hoffman was the 13-year old son of William and Pearl Hoffman whose farmhouse was opposite the Parkerson’s where Minnie boarded during the winter of 1918-1919. James F. Chalmers was the six-year-old son of Arthur and Lena Chalmers who had a farm in Grant Township, Riley County, Kansas. 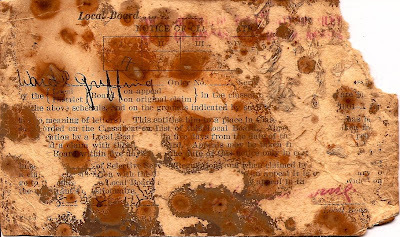 This is the original postcard I wrote to Minnie from the YMCA at Camp Funston. Please excuse my penmanship. It was a long, rough day. I suppose this is what we looked like. I write Minnie a quick postcard letting her know of my arrival at Camp Funston. Dear Kid, Finally got here alright but it was awful slow. Everything has been hell because of a wreck at Manhattan. Am at a “Y” just a few steps from the barracks. Am still at the receiving station. Will be moved tomorrow. Just had supper – beans macaroni, bread & coffee. Am with a bunch from Kansas, Colorado, Iowa, & negros from Missouri. Will write later, -- W.C.G. I am ordered to report to Camp Funston. 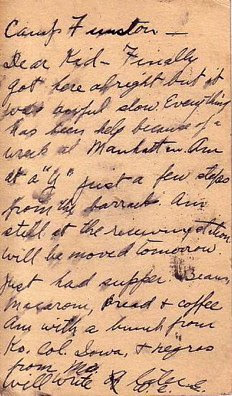 On the 2nd anniversary of her sister’s wedding, Minnie writes me recalling her sister Bertha’s wedding at "Pinehurst." She describes problems with parents of her school children and of receiving news that Bertha and her husband Charlie Scholer are moving from Topeka, Kansas to Washington D. C. She says she plans to take the train to Topeka the following day to see Bertha before she goes. Just as I wrote the date now, I was reminded that [my sister] Bertha was married two years ago today. I remember it was the Sunday evening before that you came home with me from somewhere – Munger’s I guess – and I took you in the parlor and Bertha scolded me so for it afterwards because she and Charlie [Scholer] had fixed the wire frame for the arch in the south window. I know I felt kind of foolish when I saw it. I don’t know what you thought. School went fine today. Mr. Blow called up this morning and said the little girl said the water wasn’t good at the school and thought they ought to take an engine up and pump it out. Mrs. Parkerson told him he couldn’t always believe what children said and that the teacher said it was alright. Some members of the school board heard what he had to say and it sure made them sore. They told Mr. Parkerson that they never pay any attention to what he says. It’s all blow, but they mighty soon will shut him up if he tries to make any trouble. By the way, Ward, he is the fellow you’ve heard Papa speak of – that great big fellow that knew everything at school meeting and doesn’t own a thing to his name but a wife and two or three kids. I thought he was a bachelor but he is not. I got a letter from Mama today containing a letter from her, one from Louisa, and one from a girl I met in Hollister [Missouri] this summer. Mama sent a clipping from a Manhattan paper in which it told about the fifty-five men having to leave today for camp. I suppose you are one of them. If you are at Camp [Funston], I don’t see how you will get this letter, but I will send it to your home anyway. You don’t need to read these old letters but I love to write to you. I get so lonesome in the evening. I do wish my ink would come. My pencil has worn off almost to the wood and I despise to write or read a letter written with pencil. Mama said you boys were haying over at John Kimball’s. It sure seemed nice to hear something about you, just to know that you people are in existence down there. I guess Mama knew that. I rather expected a letter from you today; sure will tomorrow, but I guess you are busy. I wonder where you are tonight. It seems awful not to know. Well I guess you are a soldier boy. 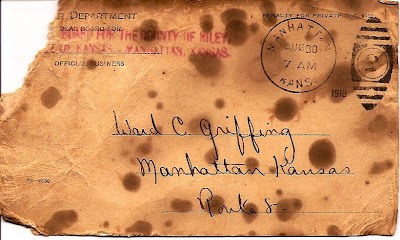 Mama sent a card with the ink saying that you had a phone call to report at Camp Funston Thursday. I wonder how long you will have to remain in detention camp and if you can receive mail and send out mail? I talked to Mama tonight, that is Central [Switchboard] had to repeat everything, and she said [my sister] Bertha and Charlie were going to Washington [D.C.] and for me to go to Topeka tomorrow. The folks are haying so they can’t come after me in the morning. So I am going to Garrison Crossing (may half to walk) and take the noon train and will get in Manhattan in time to take that noon train. I will come back Sunday afternoon and the folks [will] bring me back up here that evening. Wish I could get a look at you, but I guess I won’t. School is going fine – wouldn’t change with any teacher in Riley County. I sure like those [Krause] twins. I always was kinda crazy about twins it seems. I wish you could be at home. We would have the most fun this fall and winter. Kid, I wonder what kind of a hard old bed you are sleeping in tonight. I wish it was the kind I have. P.S. Remember our last trip to Topeka? No letter [from you] yet. 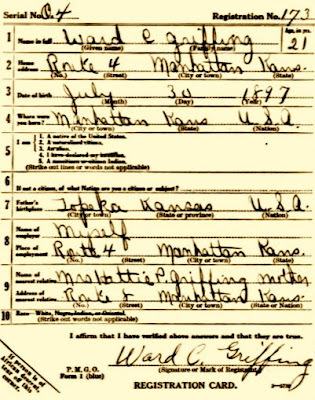 Minnie's older sister Bertha Marie Frey was born 11 August 1896 in Odgen, KS. She married Charles Henry Scholer, six years her senior, on 5 September 1916. 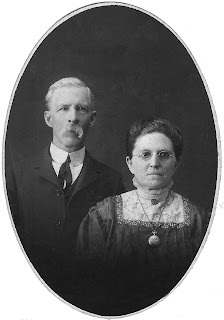 They were married at "Pinehurst" -- the stone family farmhouse purchased by Minnie's father, Charles Frey, at 1820 Claflin Road in Manhattan, Kansas in 1911 (although the family had already moved to their new farm east of the college and north of Bluemont Hill by 1916). Pinehurst is now the student center of the Church of the Latter Day Saints. Alonzo Munger and his wife, the former Alice Mosher, had a farm north of the Griffing farm on College Hill. Alonzo and Alice’s daughter, Stella Constance Munger, was born 17 August 1900. She was one of Minnie’s best friends and eventually married Minnie’s younger brother, John Charles Frey. Stella Munger also taught in a one-room school house at Deep Creek in Riley County during 1918-1919. During the summer of 1918, Minnie attended a girl’s camp in Hollister, near Branson in the Missouri Ozarks. John M. Kimball had a farm near the Munger's and Brubaker's not far from the Frey Dairy Farm northwest of Manhattan. 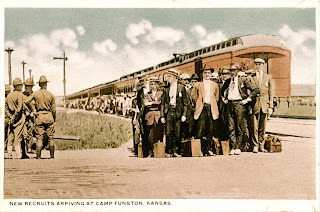 According to the Fort Riley Historical & Archaeological Society, Camp Funston was established as one of sixteen Divisional Cantonment Training Camps during World War I. Construction of the 2,000 acre camp began during the summer of 1917 and eventually encompassed approximately 1,400 buildings. Major General Leonard Wood commanded the camp. During World War I, nearly 50,000 recruits from the Great Plains trained here. They became part of the 89th Division that deployed to France in the spring of 1918. In addition, the 10th Division and black soldiers assigned to the 92nd Division received their basic training at Camp Funston. The first recorded cases of what came to be the world-wide influenza epidemic were first reported here in March 1918. Garrison Crossing was the nearest station on the Union Pacific Railroad that followed the Blue River valley. The station was a couple of miles from the Sherman school house where Minnie taught. Minnie tells me more about her students and finishes her letter on the following day. Well it’s raining and cold but it is going to be fine sleeping tonight. I pulled my first bone today. I didn’t build a fire and I believe now I should have. The children came to school bare-footed and two of the little girls cried this evening because they were so cold. The rest of us felt fine. I see [now where I’ll] have [to build] a fire in the morning. I’m crazy about my 7th grade class. They are all good and are so interested in their schoolwork. We have a great big new flag. We sent for new rope today so we can put it up in [the] school house. Today I had two of the pupils hold it while we had flag salute in the morning. I hope you are not drafted Thursday. I hope something has turned up better. I wish you could come up Sunday but I suppose you won’t even be at home then. I know Mr. and Mrs. Parkerson would be glad to have you. They are used to it. I know from what Mrs. Parkerson was telling me this evening. I’m so glad to have you to think about when I get home at nights. If I didn’t, I believe I’d go crazy. You told me to keep busy and I sure am. Every minute of the day is full until evening. I don’t study so much in the evening as I will after awhile. Well, I know the children well enough by this time to know we will get along as far as they are concerned – [I’m] not a bit afraid of them. But one of the little primary girls is awfully spoiled and she cries half the time. She is impudent but I soon put a check to that. We would get along alright and I would feel fine about it if her folks wouldn’t interfere, but I’m afraid they will. She goes home and tells lies. She told her mother that the children teased her, which is the biggest one I have ever heard. Also, she was too cold yesterday. Mrs. Parkerson heard her mother talking over [the party line] phone and it didn’t sound any too well. But Ward, what am I to do if she will tell her folks untruths? I know I will never do anything I shouldn’t and will treat her alright, but I can’t help what she tells. A little orphan boy comes from the same home. I just love him, he’s so good. I’ve unburdened my heart now. I feel lots better. I’m not afraid tho. Mrs. Parkerson told me stories tonight that made my hair stand on ends. They have had awful times [with discipline in the school house] till last year. [They] have [had] regular fistfights up here at school house. But I don’t think there will be anything like that while I’m here. I’ll bet you are just turning up your nose. My tales of woe don’t interest you any. But remember I haven’t anything else to write about. You probably wonder then why I don’t write the brighter side of the school. That would take too much room because it is almost all bright and cheerful. I love to teach and I love children – especially these. But Oh! you parents. I wish I could spend about two free nights at home, and it would do me a world of good to be with you awhile. I wonder what you are doing now. I would give anything, almost, to see you. What did you do last Sunday? Be sure to tell me all the news from College Hill when you write. If Mr. Yenawine hasn’t heard any different, tomorrow is the dreaded day [of the draft]. P.S. I sure wish I could see you. Mr. Yenawine was the chairman of the Riley County draft board. 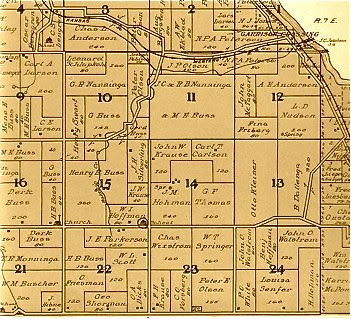 Minnie’s one-room school house is circled in Sherman Township just below the "A" in Sherman. The approximate location of present-day Tuttle Creek Dam is hand-drawn on the map. 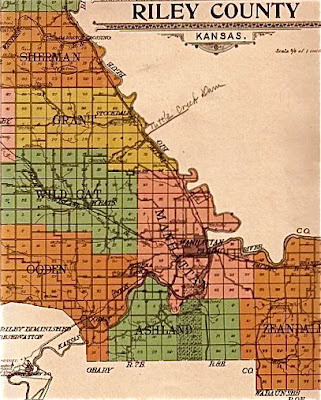 This 1909 map of Riley County shows Minnie’s school (circled) at the south-east corner of Section 15. Minnie boarded with Mr. & Mrs. Parkerson whose farmhouse is shown southwest of the school. 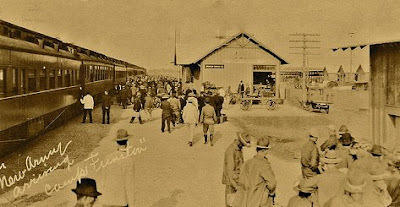 Garrison Crossing (located upper right) was the nearest train station to where Minnie was lodging in Sherman Township. 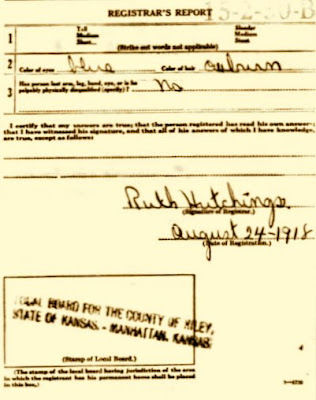 On August 24, 1918, less than a month after our 21st birthday, my twin brother Willis and I went down to the Riley County Courthouse and registered for the draft. Board registrar Ruth Hutchings took down my information and I signed it. Since our father was already dead and only my brother and I were left to run the family farm and care for our mother, it was determined that only one of us would need to serve. I was assigned a IA classification. Though badly deteriorated, here is the notice I received from the local draft board less than a week after registering. My brother Willis received a "III T" classification. The "T" stood for Temporary meaning that he would only be inducted when all of the men receiving I & II classifications had been taken. Top: James and Etta Parkerson, with whom Minnie boarded while she taught school in Sherman Township, Riley County, Kansas. Circa 1920. Bottom: The Parkerson farmhouse in 1938. Photographs courtesy of Jim Olson. Minnie tells me about her first day of teaching school in a one room school house in Sherman Township, Riley County, Kansas. I am still at home in Manhattan awaiting my induction into the army. It would be three more years before I would marry Minnie. Oh how I wish I could talk to you tonight. My first day of teaching is over. In some ways I like it fine. In other ways I wish it was my last day. I expect you are wondering why I am writing with a pencil. I discovered the first thing I have forgotten to bring and that is my fountain pen ink. I know I put a pencil in my box of school materials but I couldn’t find it at all tonight and I didn’t know what to do. I wanted to write you so bad and I didn’t want to ask Mrs. Parkerson for a pencil. I asked her for fountain pen ink and she said she didn’t have any so I hunted all through my trunk and finally found this poor stub in my pocket book. I must send home for ink. That owl down home must have followed me up here. There’s one howling right here by my window. I don’t like to hear it up here. Those [Krause] twins I have in school are sure enough twins. They look exactly alike. I don’t make any attempt to tell them apart as yet. And they are so hard of hearing [that] I had to change their seats up nearer the front [of the class] the first thing. I forget to yell at them once in awhile but they don’t hesitate to remind me of it. I know you would just collapse [laughing] if you were to see me shouting at those kids, and what is worse, in the winter they get colds in their heads and have their ears stuffed full of cotton half the time too. Mrs. Parkerson said the [previous] teachers always come home almost desperate. But they are smart [kids]. One little primary girl cried to go home during opening exercises. I read from the Bible and we all repeated the Lord’s Prayer, and all the time she was crying and sobbing so loud. We sure had a concert. I wonder if you folks had a big rain last night. We thought we were going to. It sure looked and sounded like it. But it didn’t rain very much. The road was real muddy this morning but dry tonight. I wonder most about you. If I only knew. I do hope you will be home a week from Sunday. Maybe you will get in at the College yet. Ward boy, I think I have been the luckiest girl I’ve ever known the last three years. If I could only continue to be. But this seems far from it. No one, but God, will ever know what I am suffering these days. But I suppose we must both keep on trying to be happy knowing what has been and what may be in store for us in the future, if we do our part well. Minnie taught school in Sherman Township, Riley County, Kansas. 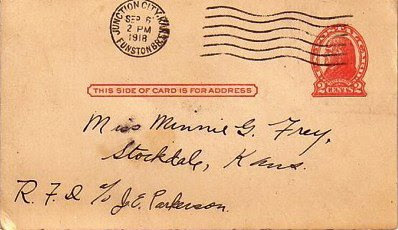 The nearest Post Office was in Stockdale, Kansas. 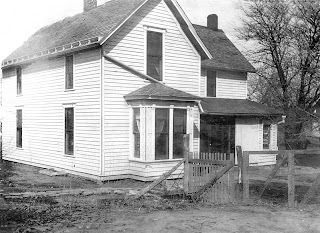 The one-room school house where Minnie taught was in the south-center portion of Sherman Township, a couple of miles west of the Blue River. The school was constructed at the south-east corner of Section 15 on the property of William I. Hoffman. Minnie boarded with 70-year old James E. Parkerson and his 54-year old wife Etta, both natives of Germany. Their farmhouse was less than one-half mile west of the Sherman school house. The twins mentioned here and elsewhere throughout Minnie’s letters were Lloyd and Floyd Krause who were born in 1904, making them 14 years old when enrolled in Minnie’s school. They were the children of a second-generation German immigrant farmer named Henry F. Krause and his wife Ethel. No explanation is given for the boys' deafness but it was not uncommon at that time for children to sustain hearing loss from German measles. My name is Ward Clarke Griffing. 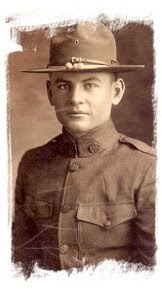 I served during WWI as a member of Company E, 20th Infantry at Camp Funston (part of Fort Riley), Kansas. I was inducted into the army on 5 September 1918 at the age of twenty-one. While training at Camp Funston, I survived the influenza epidemic of 1918-1919, the worst pandemic in history. In all likelihood, had our company not been quarantined part of the time, I would have been assigned to the 10th Division and sent to the trenches in war torn Europe. I longed to “go over” and fight for the Allied Forces but the war ended before the call ever came. After hostilities had ended overseas, my company was detailed to guard duty at a recently completed explosives plant in Nitro, West Virginia where I served for a little over two months before being discharged. At the same time that I was experiencing military life, my sweetheart, Minnie Grace Frey, was facing her first year of teaching in a one-room school house in Sherman Township, Riley County, Kansas. Her letters to me are full of daily class activities, providing invaluable insight into the life of a country school teacher in the early 1900’s. Because my family has a penchant for keeping everything, the letters Minnie and I exchanged in 1918-1919 were never thrown away. They were safely tucked away for decades and now provide a window on life in early 20th century America. There are a total 145 letters or postcards included in this collection. Minnie wrote 62 of them, I wrote 80, and my mother (Hattie) wrote three. I’ve corrected some of our spelling errors but transcribed them otherwise exactly as they were written. Now, won’t you let me take you back to another world – a world of first generation airplanes and second generation cars; a world of picnics, box socials, sunny Sunday afternoon strolls, party phone lines, silent movies, and singing around the piano or the Victrola; a world of muddy roads, interurban railcars, and slow trains; a world of agriculture, dairy farming, and one-room schoolhouses; and finally a world torn apart by war and the scourge of an influenza epidemic that reached deep into the heartland of a place called Kansas.